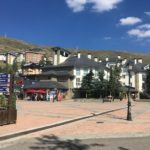 The high season for this resort village is the skiing season in winter, but in summer (June – early October) you can use it as a base for hiking or downhill cycling. It is less pretty than the older villages, but it does have plenty of hotels and apartments for all budgets. From late June until early September a few ski lifts are open, making it easy to reach the high mountains.